1 Cor 5:9 ("I have written you in my letter not to associate with sexually immoral people", NIV) refers to an early letter, sometimes called the "warning letter". The Severe Letter. Paul refers to an earlier "letter of tears" in 2 Corinthians 2:3–4 and 7:8. 1 Corinthians does not match that description; so this "letter of tears" may have been written between 1 Corinthians and 2 Corinthians. The abrupt change of tone from being previously harmonious to bitterly reproachful in 2 Corinthians 10–13 has led many to speculate that chapters 10–13 form part of the "letter of tears" which were in some way tagged on to Paul's main letter. Those who disagree with this assessment usually say that the "letter of tears" is no longer extant. Paul writes 2 Corinthians, indicating his desire to visit the Corinthian church a third time (2 Cor 12:14, 2 Cor 13:1). 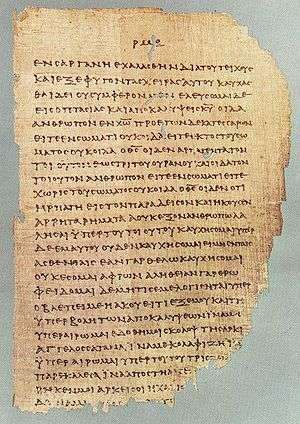 The letter doesn't indicate where he is writing from, but it is usually dated after Paul left Ephesus for Macedonia (Acts 20), from either Philippi or Thessalonica in Macedonia. In Paul's second letter to the Corinthians, he again refers to himself as an apostle of Christ Jesus by the will of God and reassures the people of Corinth that they will not have another painful visit, but what he has to say is not to cause pain but to reassure them of the love he has for them. It is shorter in length in comparison to the first and a little confusing if the reader is unaware of the social, religious, and economic situation of the community. Paul felt the situation in Corinth was still complicated and felt attacked. Some challenged his authority as an apostle, and he compares the level of difficulty to other cities he has visited who had embraced it, like the Galatians. He is criticized for the way he speaks and writes and finds it just to defend himself with some of his important teachings. He states the importance of forgiving others, and God’s new agreement that comes from the Spirit of the living God (2 Cor. 3:3), and the importance of being a person of Christ and giving generously to God’s people in Jerusalem, and ends with his own experience of how God changed his life (Sandmel, 1979). ↑ Harris, Murray J. (2005). The Second Epistle to the Corinthians. The New International Greek Testament Commentary. Grand Rapids, MI: Eerdmans. ISBN 978-0-8028-7126-8. 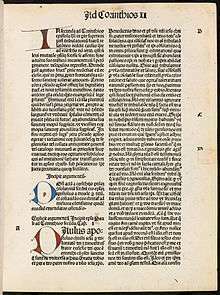 ↑ New Testament Letter Structure, from Catholic Resources by Felix Just, S.J.